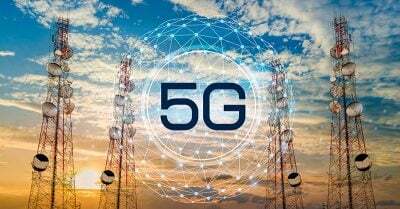 … powerful 5G (fifth-generation) networks and technology are about to subject everyone, on a continuous basis, to unprecedented forms and amounts of mandatory irradiation—without prior study of the potential health impact or any assurance of safety. Now, however, a global 5G “frenzy” is upon us and is coming into full force. The rollout of “blazing fast” 5G technology will “dramatically increase the number of transmitters sending signals to cellphones and a host of new Internet-enabled devices.” The time is ripe for greater grassroots awareness of the undisclosed tradeoffs between convenience and 5G’s potentially catastrophic health effects. Far from a simple “next-gen” upgrade, powerful 5G (fifth-generation) networks and technology are about to subject everyone, on a continuous basis, to unprecedented forms and amounts of what retired U.S. government physicist Dr. Ronald Powell calls “mandatory irradiation”—without “prior study of the potential health impact” or any assurance of safety. Considering that young people (with their smaller body mass and developing brains) are particularly vulnerable to radiation, the Environmental Health Trust has termed 5G “the next great unknown experiment on our children”—and the entire human population. In fact, the “giant uncontrolled experiment” on children and adults has already begun, despite an urgent international appeal by tens of thousands of scientists, doctors, environmental organizations and citizens calling for a halt to 5G deployment. In 2018, telecom carriers in the U.S. and Europe began rolling out 5G technology in dozens of cities. Focusing (for now) on “dense urban and high-traffic areas” in the U.S., AT&T began positioning its 5G infrastructure in major cities in eight states, and Verizon started offering 5G home broadband service in “select neighborhoods” in a handful of cities. … health problems such as insomnia, miscarriage, memory problems and other neurological issues, and there are widespread reports of annihilation of insect and bird populations. For the most part, health concerns have ranked as a tiny footnote in the midst of the massive hoopla about 5G’s speed and capacity, although trade magazines admit that there may be “some objections” to 5G due to “concerns over potential health risks.” In both Europe and the U.S., however, individuals living and working in proximity to newly installed 5G towers and antennas are telling a different story. Many have immediately started experiencing health problems such as insomnia, miscarriage, memory problems and other neurological issues, and there are widespread reports of annihilation of insect and bird populations. … even in the home environment, 5G technology [will] blast through walls and cribs, making a mockery of the notion that ‘your home is your castle’ in which you are supposed to be safe. Scientists, doctors and experts from around the world have issued repeated warnings about 5G’s risks, drawing on published research on MMWs as well as thousands of studies showing the harms caused by other mobile and wireless technologies. … children who began using either cordless or mobile phones regularly before age 20 had more than a fourfold increased brain tumor risk. The UN whistleblower states, “People’s first reaction to the idea that 5G may be an existential threat to all life on Earth is usually disbelief and/or cognitive dissonance. Once they examine the facts, however, their second reaction is often terror. We need to transcend this in order to see 5G as an opportunity to empower ourselves, take responsibility and take action.” Some of the actions that people have taken include signing the International Appeal; learning about the multiple reasons to be concerned about 5G radiation and telling others; talking to legislators about why rushing legislation that streamlines the deployment of 5G small cells is a bad idea (and also raising the awareness of legislators and state utility commissions about the risks of smart meters); and changing their relationship to their devices, including using wired rather than wireless Internet connections (or turning off WiFi routers at night) and adopting other simple steps.